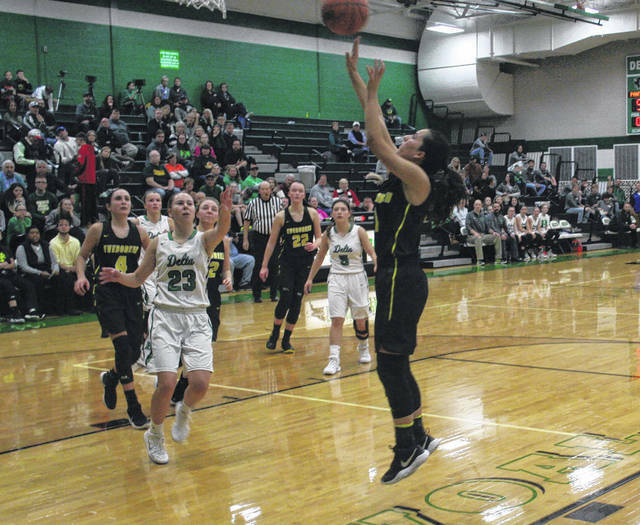 Abi Borojevich handles the ball for Evergreen in a game at Archbold last season. She was a second team All-NWOAL performer for the Vikings in 2017-18. Kelsie Komisarek of Evergreen makes a basket versus Delta last season. She also returns for the Vikings this season. Evergreen girls basketball has a lot of production back from last season as they look forward to a quality season in 2018-19. The main returnee for the Vikings is Abi Borojevich, who was second team All-Northwest Ohio Athletic League a year ago. She averaged 10 points per game (ppg). Also back are Savannah VanOstrand who averaged 5.14 ppg, Kelsie Komisarek who averaged almost five (4.9 ppg), and Mady Peluso at 3.6 ppg. 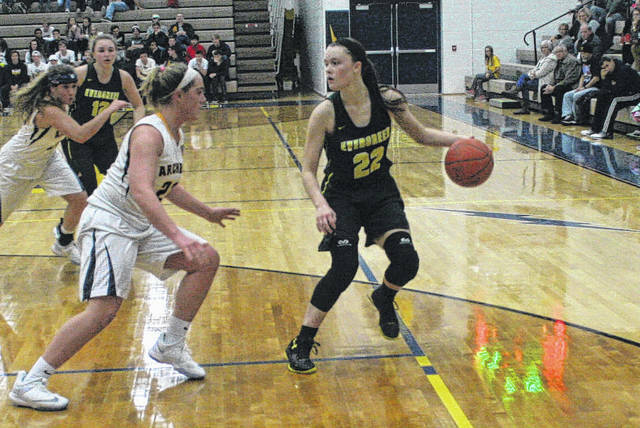 They lose just one all-league performer in Hannah Herr who was honorable mention All-NWOAL. Also departing were Bailie Sutter and Jamie VanLoocke. Newcomers for the Vikings are Bekah Bowser, Jordan Lumbrezer and Naomi Brand and Nicole Brand. “Girls have picked up their defensive intensity and have acquired more patience on offense,” said Cymbolin on her team’s potential strengths. A lack of size is the main weakness for the Vikings, according to their coach. Cymbolin is unsure of how the league race will play out. And she has a suggestion for league officials.